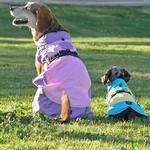 Our all-new Raincoat Body Wraps are built from the same popular Alpine Coat style! 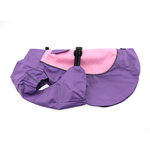 With a simple slip over the head and an adjustable strap and buckle clasp around the back, these rain coats are easy to fit on dogs of all sizes! The bright new colors are prefect for those Spring rain showers! They are waterproof both inside and out and with the coverage on both the top and bottom of your dog it helps to keep your dog dry!